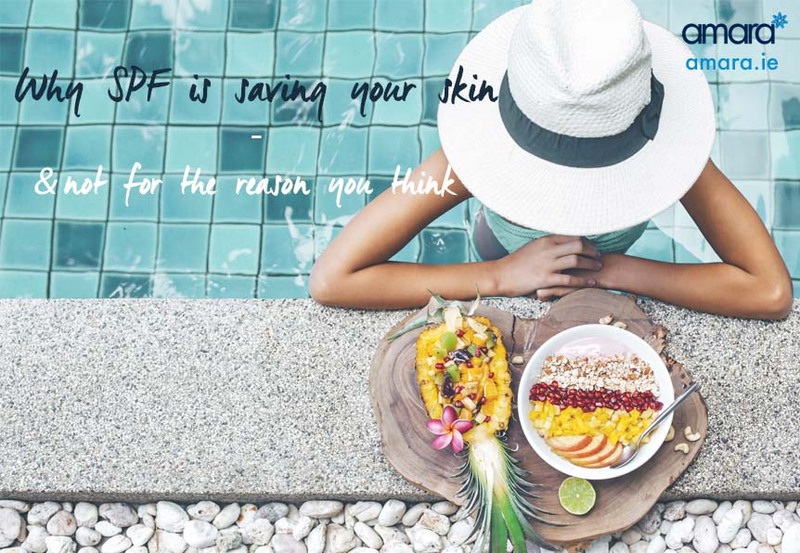 Why SPF is saving your skin – not for the reason you think . SPF is a funny one for people living in Ireland, we think that we don’t need it because we may get one good week of ‘real sun’ in the year. Despite years of research stating that daily SPF is essential particularly for those working on a computer all day. All as well as protecting your skin SPF can also heal it! Here’s why you should be wearing it. The sun as we know damages us more than it helps if we are unprotected. A small amount of sun gives us essential vitamin D, however, our skin needs to be protected from the HEV rays ( high energy visible length). 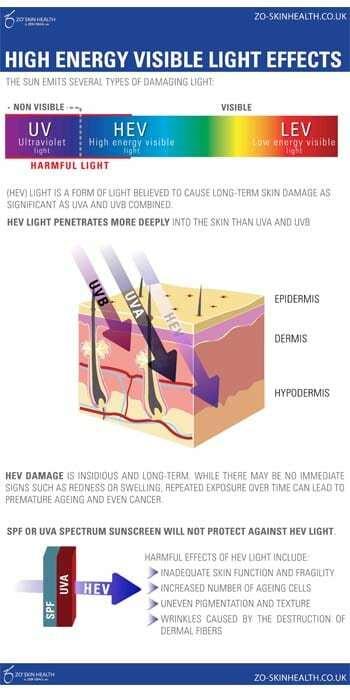 HEV rays cause DNA damage and inflammation – this leads to early ageing of the skin such as early lines, wrinkles, crepiness of the skin, sagging, collagen loss and eye bags. The sun is said to cause 80% of premature ageing – Something that is easily prevented. Pigmentation comes in many forms such as freckles, sun spots or melasma – it can also be the root sign of Melanoma. Wearing a DAILY physical SPF is essential to prevent pigmentation for holidays in the sun a stronger chemical one may need to be used to help with the higher strength UVA and UVB rays. A physical Sunscreen blocks the rays from reaching your skin while the chemical reacts with the UV lights dampening their effect. Rosacea is a huge problem for Irish skin as well as pigmentation, typically Rosacea is found in pale skin likely if you freckle when in the sun. The UVA and UVB rays damage the small blood vessels under the skin when you blush or flush from heat or even different foods, fluid leaks from the damaged vessels causing blotches and bumps on your face. Acne, like Rosacea, can also be caused by the weakening of the skin and the creation of large pores – which are then easily blocked and turn to acne and congestion. Dull and dry skin. – Your skin barrier has been compromised leading to the dull and dry skin. A full night sleep is great when you can get it, eventually even if we get our 8 hours you may find that your skin and particularly the sensitive area around your eyes look dull and tired. If you work in front of a screen all day (which the majority of us do) plus continue on the commute and for our downtime when we’re home. You are actually exposing your skin to large amounts of BLUE HEV rays found on your computer screen, phone and LCD TVs. This blue light damages deep in our skin without the sunburn. Without a barrier protection like SPF, these rays cause sagging around the eyes, dull, blotchy and sagging skin making us appear tired. Much harder to solve than a good night’s sleep. As well as acne and Rosacea, the sun can cause scars to become inflamed turning them darker and more obvious. Scar tissue is more sensitive than just skin and will react to the sun quicker than the rest of our face. Depending on the SPF and texture it can help set your makeup or even add a tinted moisturiser look to your face. This will help create an even surface for your makeup to sit on and allow it to last longer. Are All SPF’s the same? Broad Spectrum (or full) blocks both UVA and UVB rays rather than just UVB rays which cause burning. Physical sunscreen blocks the UV rays from reaching your skin – Recommended for daily use particularly in front of screens. Chemical sunscreen reacts with the UV dampening their effect on the skin. Fractionated Melamin is exclusive to ZO skin health SPF, this provides extra protections against HEV light and also contains an exclusive 12 hours time release antioxidant – this provides nutrients all day while neutralizing free radicals, protecting against pollutants and encourage repair of damaged DNA. To prevent or help repair damage skin our Skin Health Specialists can advise you in a consultation what treatments, creams and SPFS are better for your lifestyle.